I'm back with another tan review today, and this time it's the Bondi Sands Tanning Lotion in Dark. I had been following Bondi Sands on Instagram for some time, so when they announced that they were launching in Superdrug, I knew I had to get my hands on some. Now, I'm definitely more of a mousse tanner rather than lotion, but the lotion was the only one my Superdrug had in stock so I thought I'd give it a go nonetheless. The lotion is really easy to apply, and allows more time for blending than mousses do, although generally you will have to take longer to blend anyway to avoid streaks. However, it does take a while to dry and I felt quite sticky whilst it was developing. You can leave this on for anytime between an hour to overnight. I generally leave all tans on overnight, but I didn't have time to do that for the pictures above, so the results here are from around 3 hours developing time. You just take a shower with warm water (no bath/shower products, just water), then it continues to develop for another 8 hours. When I first came out of the shower, I didn't really look that dark, maybe a hint of tan. However, after 8 hours, you could definitely see a significant change in my skin colour. The picture above is the next day, so probably 18-ish hours after I washed the tan off. As you can see, it's not a super dark tan (like the Madame La La or St Tropez ones), but I love it for day-to-day tanning as it doesn't look too full on but gives a lovely golden colour, that I found didn't leave any patchiness or unevenness. In terms of lasting time, I haven't found this to last especially well, probably 4-ish days before I feel like I need to top it up. As with all my tan reviews, bear in mind that I go to the gym fairly often and unfortunately tan and sweat don't mix. So, you could definitely make it last longer if you avoided the gym (any excuse!) and using any oils on your skin. 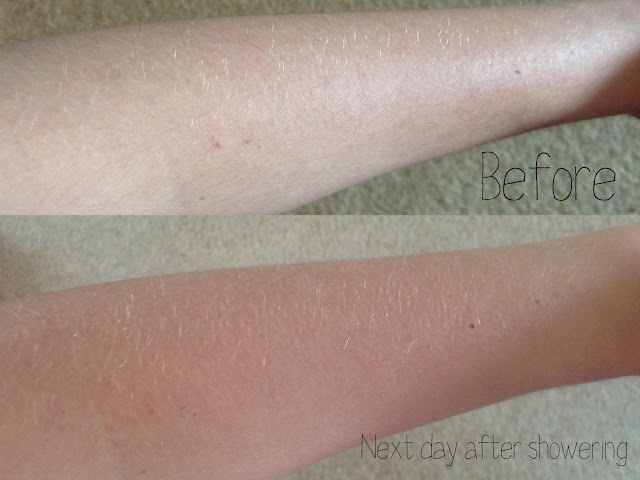 I have actually got a tanning tips post coming up next week, so check that out for more tips on longer lasting fake tan. Overall, for me this tan is a more daytime tan, and for going out/special occasions I'd definitely lean more towards my Madame La La or St Tropez tans. In terms of price, it's not the cheapest, but still cheaper than the likes of St Tropez, Xen Tan etc. I also love the coconut scent, really fresh and lovely for summer! I also really want to try the gradual tan, as it looks like that would work great in conjunction with this tan and possibly increase lasting power. What do you think of the results? Have you tried Bondi Sands? Let me know in the comments!